SANTA BARBARA, Calif. August 22, 2017. HEICO Corporation (NYSE: HEI.A and HEI) announced today that its IRCameras, LLC (IRC) subsidiary supplied a specially designed infrared imaging camera which was incorporated into an Airborne Infrared Spectrometer (AIR-Spec) used to observe and obtain measurements of the total solar eclipse visible throughout much of the United States yesterday. IRC Team Members designed and produced the device entirely in the United States. This research is funded by a National Science Foundation Major Research Instrumentation grant to enable coronal emission line observations during the 2017 Great American Solar Eclipse. Participants in the study include the Smithsonian Astrophysical Observatory, Harvard University, the National Center for Atmospheric Research (NCAR) Aviation Facility and the High Altitude Observatory. The AIR-Spec instrument was flown along the path of totality of the solar eclipse aboard a specially equipped Gulfstream V aircraft operated by NCAR. The airborne platform extended the observation time of eclipse to approximately 4 minutes and eliminated interference from atmospheric water vapor that posed significant challenges to ground based observatories. For the first time, AIR-Spec allowed measurements of the solar corona in the infrared spectrum, thereby increasing our understanding of various phenomena including solar wind and plasma heating and acceleration. Santa Barbara, CA-based IRCameras designs and manufactures in the U.S.A. the most technologically advanced infrared imaging systems available for scientific, industrial and military applications. 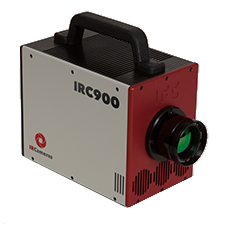 In addition to its extensive line-up of standard commercial infrared cameras and IDCAs, IRCameras offers custom design and build services to meet unique optical, packaging and space-constrained requirements. For more information about IRCameras, please visit our website at: http://www.ircameras.com.